rewards of a clear mind and clear desk. the flow of money into your life. a negative mindset or faulty mental programming. of unnecessary clutter in your life. environment. Answer them as either true or false. your body is found beneath the rubble. there's a family of squirrels living among them that you're not even aware of. Days of Our Lives, or can't make a decision without your opinion first. life instead of what is possible and available to you. not you realize it, it brings with it a negative energy that is blocking your progress. 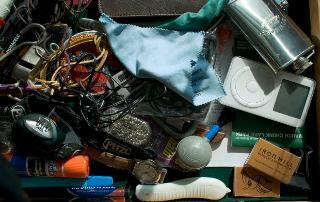 Fortunately, clutter can be removed and it doesn't have to be unpleasant or difficult. point, so be kind to yourself in the process. De-cluttering your life is very doable. garage, car) makes you wince every time you look at it? clear desk, organized files, to see out the window that is blocked by boxes? after each use. Taking one extra step in the moment saves you ten down the road. file, tidy and organize is all you need to remain clutter-free. you of energy and blocking your productivity? efforts, make the hard decision as to whether or not there's a place in your life for them. Become very stingy with how you spend your time and with whom. about why things can't be done or won't work? understand this reality and keep it in check. productivity, and natural creative flow.